Weight gainer supplements also known as mass gainers can be extremely beneficial for packing on lean muscle mass, aiding in post-exercise recovery, gaining weight, and enhancing muscle strength. 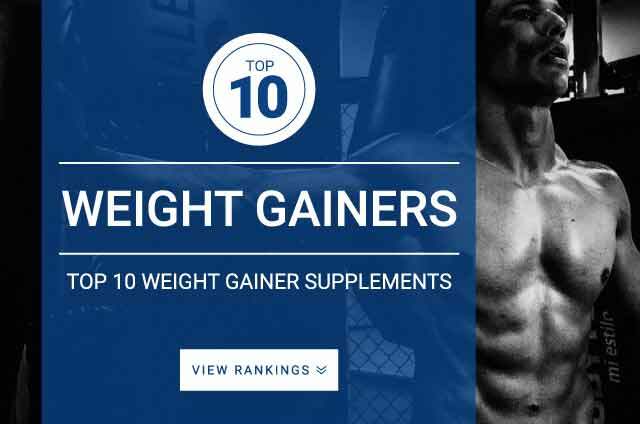 Six people; 67 hours; several late night gym sessions; interviews with dietitians; lots of weight gainer shakes – that’s what it took to formulate the most informative weight gainer supplement resource on the internet. Reviewing formulas based on the best ratio of protein, fat, and carbs, as well as the source of protein. Reviewing products for recalls, ingredient sources, history, and customer satisfaction. Ingredients – Finding a weight gainer that fits your desired macros will be best. Calorie content – Calories will come from the total protein, fats, and carbohydrates, and the best weight gainer supplements will have a high amount of protein. Products with a lot of calories will be a good choice. This is important because it will be crucial to find a supplement that has the required calories to help you gain weight fast. Digestibility – Good digestibility is a must if you want to see good results. Ease of use – Taste, flavor, mix-ability. If these are important to you, make sure you find a product that meets the requirements. These features make supplementation easier for you. Brand Credibility – A well-known brand may be a good indicator of a quality supplement. Stick to the well known product brands for best results. Weight gainers are a high calorie shake formulated with a combination of protein, fats, carbs, and micro-nutrients to help you gain weight fast and add more lean muscle mass to your frame. Beneficial if you are having a hard time eating enough food or cannot find the time to eat throughout the day and prefer to drink your calories. Scientific researcher shows that increasing your daily protein intake, the major ingredient in all weight gainer supplements, is effective in supporting lean muscle mass gains, strength, power output, boosting recovery and improving body composition (fat loss, lean weight gain, muscle definition, etc). Weight gainer supplements are like an advanced protein shake. Designed specifically to help athletes increase their calorie intake through meal replacement type shakes. Most guys find it easier to drink their calories. Athletes supplement weight gainer supplements to ensure caloric needs are met — this is especially important for bodybuilders. Protein, fats, carbs, and calories are needed by your body to gain weight and lean muscle mass. Without meeting the proper caloric intake everyday you won’t gain any weight. Most people struggle to eat enough calories through food so supplementation of weight gainers makes for an easy calorie boost. You don’t have to use weight gainer supplements as your choice of a calorie shake, all types of protein powders can be blend up with the right nutrients to make a mass gainer shake. Weight gainer powder makes it a lot easier for most athletes to add in more calories into their diet. Be consistent: If you drink your shake only 2 or 3 days out of the week, don’t expect any results. It may get tiring drinking a weight gainer for 30 days straight especially if you’re not used to eating this amount of calories but it is easier to drink than eat your calories. It needs to be done! Stick with it! Don’t give in too early. Try your best to be consistent. Exercise: You need to be exercising. If you expect to have a nice looking body by just drinking a supplement..thing again. You need to keep progressing in the gym. Use the extra protein and nurtients you are getting to workout harder than ever before. Make sure you take advantage of this. Timing: There is no perfect way to take your weight gainer but there are a few key time slots your can take advantage of. Drink a few scoops 1-2 hours before your workouts to give your body the nutrients it needs to fuel your workouts. Drink after a workout to aid recovery, boost muscle growth, and aid muscle repair. Aside from that you can take your supplement whenever its most convenient.